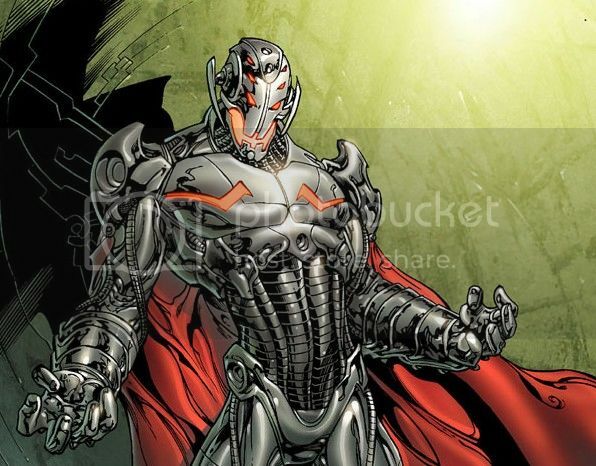 The Villain in Avengers 2: Who Is Ultron? Welcome to Ultron 101, a brief history of one of the Avengers' deadliest enemies. By now you've heard that James Spader has been cast as Ultron in the Avengers sequel due out in 2015. But if you're new to comics - maybe you got into them because the movies intrigued you - or maybe you're not a big comics fan and your knowledge of the core material doesn't spread beyond the movies - then you may have found yourself sitting idly by while all your nerdier friends were "How cool is this! "-ing last week when the news broke. So who is Ultron? Or more accurately, what is Ultron? Ultron is a killer robot so dangerous and so evil it could give the Terminator a wedgie in his steel boxers and send it crying back to Skynet! If Ultron didn't just take over Skynet already! 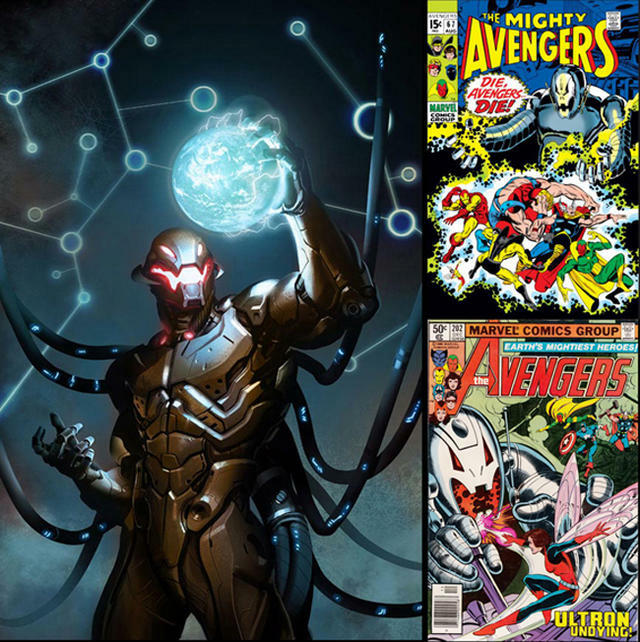 Ultron is a Silver-Age Avengers villain, having appeared way back in back in the 1960s in Avengers #54 (cameo) and #55 (full). Ultron has the classic science fiction evil-robot origin story. Created by Dr. Hank Pym also known as Ant-Man, who was working on super high-level artificial intelligence, and decided it was a great idea to build a robot based on his own personality imprinted onto the brainwave patterns. Now the good doctor hasn't exactly been the poster boy for mental health throughout the years, having gone through several superheroic identities, depending on how stable he was at the time. Besides Ant-Man, he's also been known as Giant Man (he just grew the other way), Goliath, and Yellowjacket. He's suffered multiple emotional breakdowns, and even cracked his wife in the face. So figure, that experiment worked out about as well as you'd expect. Ultron spent most of his early appearances periodically stalking Pym's wife, Janet Van Dyne, also known as The Wasp, and trying to kill his creator. 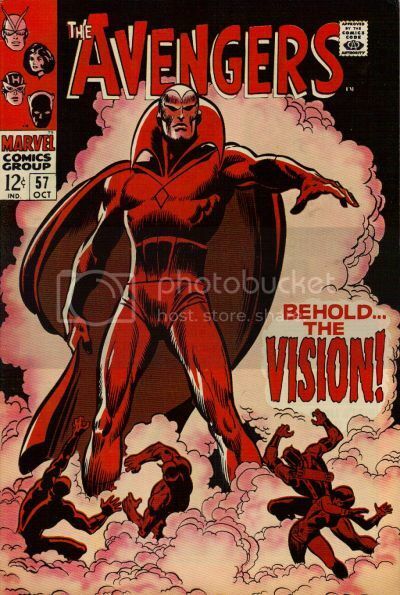 He rejects all of humanity as inferior creatures, and has on many occasions creating other robots to add to his "family," including the synthezoid Avenger known as The Vision, who was first created to destroy The Avengers, but turned on his master and destroyed him. One of the many times Ultron has been destroyed, and each time he has managed to come back deadlier than the last, upgrading himself with each new incarnation. Outfitting his metallic shell with adamantium, the same substance covering Wolverine's skeleton, Ultron is nearly indestructible. He possesses superhuman strength, speed, and durability, and can fire energy blasts from, his eyes and hands. Ultron can control machines and has been known to make robotic duplicates of himself, amassing a veritable robot army bent on the subjugation and destruction of the entire human race. As for how much of this will make it into Joss Whedon's movie, who can really say. One thing that has been confirmed, is that Hank Pym will not be the robots creator in the Marvel Cinemaverse. 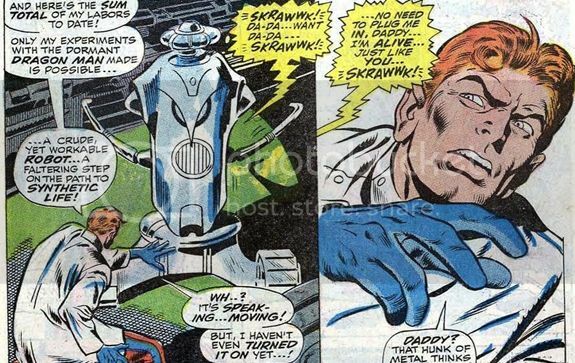 There are a lot of big brained scientists running around Marvel Comics, but as far as the movies go, pretty much nobody wants to introduce a character that can, out of the blue, make Robert Downey Jr.'s Tony Stark look like a kindergarten dropout. Ant-Man's own movie is not scheduled until after the Avengers, in November of 2015. Expect him to make an appearance, but most likely as a scientist in the employ of Tony Stark, who is the sure bet for Ultron's "father." Tony is a robotics genius, and Ultron has even been known to rebuild himself from Iron Man armor in the past. Plus, having seen remote control armor and AI take a big step forward in Iron Man 3, it is probably not a big jump to where Stark is betrayed by his own creation. Jarvis gone mad, anyone?